Not even Hurricane Katrina could prevent an otherwise devastated New Orleans from bringing its community together through jazz. Eight months after the storm tore apart neighborhoods, emptied schools and businesses, and scattered an historic confluence of musicians, the famed New Orleans Jazz and Heritage Festival rose from the debris to prove the healing power of music. On both a smaller and larger scale, two Midwest jazz festivals repeat this message every year. 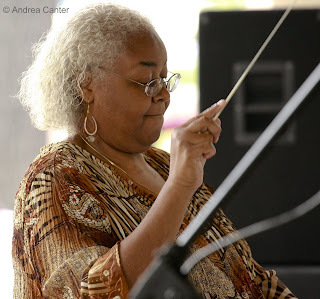 Music, particularly jazz, unites diverse communities, transcends economic as well as cultural and generational barriers, at least for one weekend in late summer. The modest Freedom Jazz Festival does not seek status as a “tourist destination” and its reliance on local musicians may keep it far below the radar screen of “world-class signature events,” yet it shares many commonalities with its giant cousin. Despite the vast difference in scope, the two festivals bring jazz to the “neighborhood” and draw heavily upon that neighborhood for both organization and performance. Both communities have longstanding, rich jazz traditions. Both communities and their festivals heavily emphasize the spirit of “passing it on,” putting student performers and jazz educators in the spotlight. 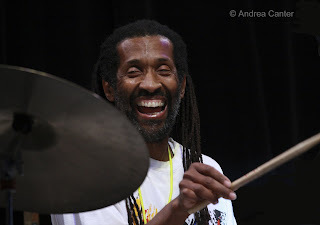 (In 2009, the FJF honored 90-year-old saxman Irv Williams with the Sam Favors Award for his contributions to jazz and 34-year-old Detroit native/drummer/educator Kevin Washington as one of its Jazz All-Stars; the 2009 DJF’s “Jazz Guardian” recipients included 91-year-old pianist/NEA Jazz Master Hank Jones and longtime Detroit Public Schools jazz educator Ernie Rodgers.) And due to economic pressures, both communities nearly lost their festival in recent years. 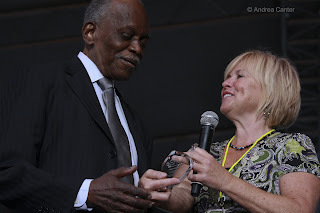 The Detroit Jazz Festival was salvaged and greatly enhanced in 2006 by the generosity of a ten million dollar endowment from the Carhartt family, particularly Gretchen Valade, which among other business owns Mack Avenue Records. The Freedom Jazz Festival canceled the 2008 event to regroup, found new sponsors, and through the leadership of Lamarr Scott and Jeff Keys, came back strong in 2009. Naturally there are differences between these two events. 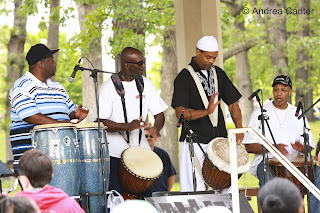 Freedom Jazz Festival is held on one Saturday in early August in a city park, drawing from the south Minneapolis neighborhoods as well as from pools of jazz fans across the Twin Cities. There’s one stage, 7-8 groups of performers, displays of area artists and community organizations. More than showing off the community to the outside world, FJF brings its community together to celebrate its own artists—celebrating its elders and the next generation. The elders in 2009 included Cornbread Harris and Morris Wilson, the newbies included the teens in Public Newsense. The Detroit International Jazz Festival is held over 31/2 days on Labor Day weekend on 5-6 stages over an area encompassing three city blocks, a city park, and a large modern riverfront plaza with approximately 100 musical acts, a “talk tent” where artists are interviewed, a “kid bop” area of jazz activities for young children, and three blocks of arts, crafts and food vendors. Beyond bringing its own community together for a multi-generational celebration in the midst of economic depression (highlighted in 2009 with a theme of jazz families, including the Heath Brothers and father-and-son teams of Brubecks, Claytons, and Pizzarellis), the DJF is one of the city’s best opportunities to show off its cultural riches to the outside world. There’s a cross pollination effect between the FJF and DJF. Among the leaders of the FJF are the Washingtons—Faye, flautist and conductor of the Capri Big Band; Donald, saxophonist; and son Kevin, powerhouse drummer and, like his parents, a dedicated jazz educator. The Washingtons moved to Minneapolis from Detroit about 20 years ago, but not before Donald had mentored the early career of one of Detroit’s favorite sons, titanic saxophonist James Carter, not before Faye and Donald had make their mark in the Detroit Public Schools, not before young Kevin had made his percussive mark as one of the city’s promising young jazz artists. 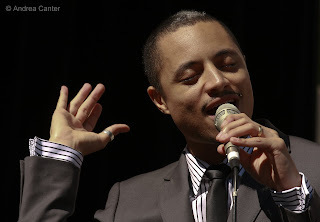 And at the 2009 DFJ, Detroit native, now Minneapolis resident Leonard King led a tribute to Detroit organist Lyman Woodard, while two Minneapolis South High grads, acclaimed vocalist Jose James and up-and-coming young bassist Chris Smith, wowed a packed Mack Avenue venue. Both festivals are entirely free. Even among 100 acts featuring many of the world’s most revered artists (Hank Jones, Dave Brubeck, Chick Corea, and Wayne Shorter in 2009), Detroit has not a single ticketed or reserved event. There’s VIP seating for those who donate at given levels, but anyone can find a seat or bring a chair. And maybe an umbrella—like the Freedom Jazz Festival, Detroit is entirely outdoors, save the Talk Tent. Compared to the Freedom Jazz Fest, which draws maybe 1000, the DJF, which draws 750,000, is exhausting if one has the will to participate over the entire weekend. Both festivals—for a few hours or a few days—generate a source of energy that overcomes fatigue, energy that shines in every note of the music, from the middle and high schoolers in the student bands to the local or international octogenarian (plus) legends, energy that fuels the audience and spills into the surrounding community. That jazz is a democratic music is never more obvious than at Minnehaha Park in Minneapolis for an afternoon in August, or at Hartt Plaza in Detroit for a weekend in September.